The weather here in Everett has been amazing for the first four games of this series – in fact, I haven’t seen a cloud so far (outside of those hanging over the Cascade Mountains to the east). Temperatures have been in the 70s (compared to the high 9os in Boise), dipping into the low 60s during the latter innings – it has been near perfect. Some News and Notes from around the organization…with the Kosuke Fukudome trade two days ago, former Hawk Tyler Colvin was recalled by the Cubs, while at AAA Iowa, Welington Castillo went on the disabled list, allowing another former Hawk, Steve Clevenger, to earn a promotion to AAA. At AA Tennessee, Dallas Beeler has been put on the 7-Day DL, while Brent Ebinger made his second trip up to Sevier County. David Macias was sent to A Daytona (with Dustin Harrington being the odd man out, earning him a trip back here to Boise). On the big league front – Jerry Blevins has been called up by the A’s for the fourth time this season, while Jose Ceda was recently sent down from Florida to AAA New Orleans for a third time. Also, Sergio Mitre’s season looks done in New York, as the Yankees put the 2001 Hawk on the 60-Day DL. Down in the desert – Tyler Gretzky (7th Round) and Darien Martin (13th Round) have signed, while lefties Andrew McKirahan (Texas) and Sheldon McDonald (U. British Columbia) have seen game action and could see a trip to Boise to provide some help in the pen in the near future. Two days into the trip to Everett and two different ball games for the Hawks – hitting three homers in the 8-6 win on Wednesday night, then losing a 10-inning decision on Thursday to the Aquasox, 5-4. Thursday’s game saw the return of Reggie Golden to the line-up, while Zeke DeVoss is expected to return to the Hawks line-up on Friday. HIGHLIGHTS: Hawks hit three homers on Wednesday night, click here (http://yotestats.i8.com/hawks/Highlights7-27-11.wma), while listen to Pin-Chieh Chen’s first professional home run here (http://yotestats.i8.com/Hawks/Highlights7-28-11.wma). WEEKEND NOTES: Interesting promotions in Everett this weekend – Japanese Heritage Night on Saturday (with Japanese themed uniforms), as the Aquasox are raising money for earthquake/tsunami relief, along with a mascot mania on Sunday afternoon. The first half of the Northwest League season has come to an end – with the Eugene Emeralds (by default) and the Tri-City Dust Devils earning a spot in the League Divisional Series in September. Eugene backed into the playoffs, their first in over a decade, despite dropping two games to Everett – earning the spot when Salem-Keizer scored nine runs in the final three innings on Monday night in Vancouver to stun the Canadians. For the Boise Hawks – the record was wiped clean and the squad has had a sort of rejuvenation, opening the second half with a pair of tight wins. The 5-4 victory at home over Spokane gave the Hawks their first series win since a three-game sweep of Yakima at the beginning of July, while the series opening win at Everett ended a five-game road losing streak. The Hawks have used a power surge of late to get the fans excited – hitting at least one home run in each of the last four games. It marked the first time since the 2008 season that the squad homered in four-straight (August 1-6), part of a season that saw the team hit 42 long balls. season last night – tying Steve McQuail of Vancouver for the league lead. Hoilman is one of 24 players in Boise Hawks history to hit 10-or-more homers in a season and the first since Kyler Burke hit ten in 2007. Joining Hoilman and Burke in the 10 homer club are Micah Hoffpauir (2002), Condor Cash (2001), Corey Slavik (2001), Jason Coulie (2000), Dave Kennedy (1993), and J.R. Phillips (1990). Six players have hit 11 homers in a season – Tyler Colvin (2006), Casey Child (1997), John Donati (1994), Mike Wolff (1992), Oreste Marrero (1989) and Jeff Mace (1987), while three have hit 12 in a season – Donnie Hood (2002), Jeff Wagner (2000), and Matt Curtis (1996). The big boppers in franchise history all had great years – as Brian Dopirak (2003), Kevin Collins (2002), Jason Dewey (1997), and Mace (1998) all had 13 homers, Ryan Harvey (2004) and Ryan Kane (1995) each had 14, Todd Greene slammed 15 homers in 1993, and Russ Canzler hit the franchise best 16 home runs during the 2006 season. I recall a conversation in the clubhouse in Vancouver with Desi Wilson about hitting slumps and streaks – him stating that a bad-hop single for Rafael Lopez, which broke the Florida State product out of a 3-for-22 slump, might be a turning point. Boy has it, as Lopez has hit safely in 13-of-14 games, raising his batting average from .237 to .327 – including a trio of three-hit games. Hoilman has also hit safely in six straight games, with Jesus Morelli logging hits in five-straight. The bullpen arms – when they are used (due to the piggy-back rotation that the Cubs have employed this season), have been solid of late. Dustin Fitzgerald has been money at home, having not allowed an earned run in 9 1/3 innings at Memorial Stadium, while Colin Richardson has provided solid middle relief in getting to closer Bryce Shafer, who has converted back-to-back saves after that ninth inning disaster in Spokane. Willengton Cruz and Yao-Lin Wang continue to pitch well, both among the league leaders in ERA and strikeouts. THE FROGS: No rain so far this year in Everett (after Jody-Gate in 2010), but the fans continue to ask why I call the Aquasox the Frogs…the picture is of Webbly their mascot (a frog) – and it has been their secondary “nickname” for over a decade. MOVIE REPORT: Trainer Bob Grimes has decided to make it a learning experience for the team on the final couple road trips of the season – as the squad will watch baseball movies for education. On the eight-hour trip to Everett, it was Bull Durham and Field of Dreams, a pair of movies that more than half the squad hadn’t seen. It was interesting to hear the comments from the staff, since many of them played in the ballparks featured in the movie. BUMPS AND BRUISES: Joe Zeller returned to the mound last night after 17 days due to soreness in his shoulder, while both Zeke DeVoss and Reggie Golden have been held out due to minor injuries. DeVoss (knee) and Golden (ankle) both took batting practice yesterday and may be in the line-up on Thursday. DRAFT NEWS: Though nothing has been made official by the Chicago Cubs, but sources have said that the Hawks parent club has made a killing on draft signings over the past week – including picks in the Top-15, which may end up being Boise Hawks either later this season or next. When the Cubs make the news official, we’ll have it to you. The last five days for the Boise Hawks have seen some the trials and tribulations that typify a normal minor league baseball season –highs and lows, ups and downs. Despite falling short of a Northwest League East Division first-half title, the squad is poised for a chance to earn their way into the playoffs during the final 38 games of the season. Newcomer Zeke DeVoss out of Miami has been an instant hit for the club, as the third-round pick set a franchise record with five stolen bases in his debut and has already swiped eight bags and is hitting a cool .471 in five games. Also rejoining the team has been Jesus Morelli, who missed nearly two months after injuring a hand in the final game of Extended Spring Training. The close of the Spokane series at Avista Stadium happened with a literal bang, courtesy of Reggie Golden, as the Hawks outfielder tried to score on a wild pitch in the sixth inning of the eventual 6-4 Boise loss. 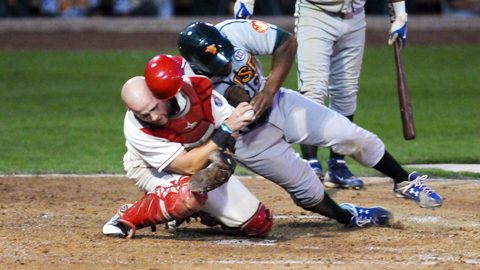 A violent collision between he and catcher Carson Vitale ensued, with the Indians backstop holding onto the ball for the final out – but Vitale took the brunt of the damage, breaking his clavicle and sustaining possible shoulder damage, more than likely ending his season. By the time Golden came up in the eighth inning, the crowd of 4,000-plus joined in unison of boo’s – a sound that mimicked that of Alex Rodriguez when he returns to Seattle. Returning home, the Hawks proved that Memorial Stadium magic was alive and well – that be it after a 4-0 shutout loss on Thursday night. Boise would go 23 2/3 innings without a run at home, finally breaking the streak on Friday night before a sellout crowd. The game would go 10 innings – the fourth time in five games vs. Yakima that went extras, with Rafael Lopez smacking an RBI single to win it for the good guys. Sunday night was also a breakthrough game – as the Hawks broke the 10-run barrier for the first time since July 1 in a 13-6 rout of Spokane, ending the Indians hope of a first-half pennant. Paul Hoilman broke the game open with a grand slam homer, part of a nine-run inning, with Willson Contreras adding an RBI single and two-run triple in the frame. The game nearly saw fireworks, as Indians reliever Leonel De Los Santos plunked Yaniel Cabezas with a fastball on the pitch following Hoilman’s bomb, with Cabezas taking a couple steps towards the mound. Both teams climbed to the top steps of their respective dugouts, but the umpires took control quickly, ejecting De Los Santos before anything got out of hand. Listen to home run calls of Hoilman and Blair Springfield from July 24 games at http://yotestats.i8.com/hawks/Highlights7-24-11.wma. to get to-and-from the press box, you know) – a true sign that a new stadium in town is needed, as the climb to the booth is nearly impossible. The pain is supposed to last another week – so wish me luck. Hawks are 180 fans below their average from 2010. 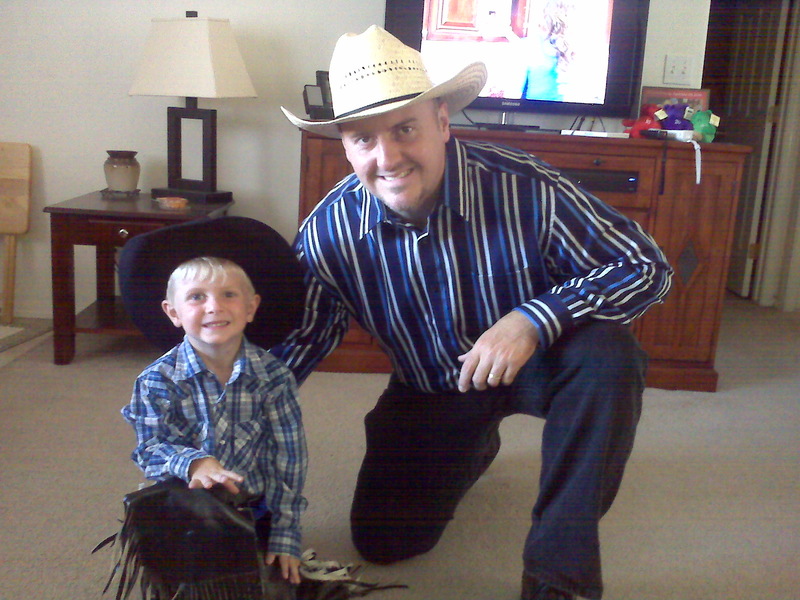 However, you have to give credit to fans in the Valley on Saturday, coming out to the yard on a night when everything was going on in town – 70,000 folks at the Boise Music Festival, 10,000 at a Katy Perry concert, 10,000 at the Snake River Stampede (which I got to attend Saturday’s matinee performance), and a few thousand at nearby Les Bois Park for horse racing, yet 2,500 fans still watched baseball. A PAIR HANG IT UP: Two players have recently hung up the spikes on their professional baseball careers – as catcher Jose Guevara and infielder Travis Garcia have retired. Guevara was in his third season with the Hawks, coming off of off-season knee surgery, but was primarily Boise’s bullpen catcher. 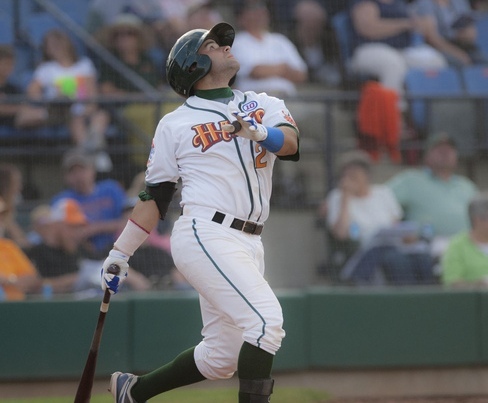 Garcia’s retirement was a mystery to some, as the 2011 draft pick retired after not accompanying Yaniel Cabezas back to Spokane after the recent trip to Vancouver. He was in Mesa with the AZL-Cubs before the decision. Best of luck to both young men. SLUMPING FARM SYSTEM: The six-game losing streak that the Hawks suffered this week was a bit of a trend across the Cubs minor league affiliates. AAA Iowa lost 14-of-17 games from July 4-23, AA Tennessee lost 11-of-14 from July 6-21, High-A Daytona lost 5-of-6 from July 18-23, with Low-A Peoria losing 9-of-11 from July 14-24 – so the Hawks, losing 11-of-13 from July 8-23 wasn’t anything out of the ordinary. 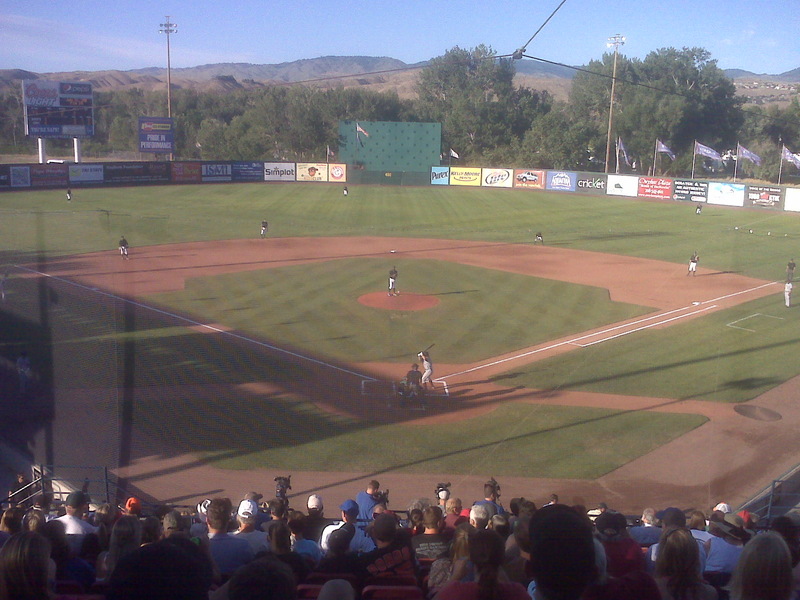 Playing in the biggest ballpark in the Northwest League has not helped the Boise Hawks chances to win a first half East Division title, as the squad has continued their struggle away from home. The Hawks have now dropped eight of their last nine games away from Boise and take a season long four-game losing streak into tonight’s finale. The team has fallen from 14-10 on June 10, with the current tailspin dropping the club to 15-17 – their lowest mark since Game 3 of the season in Eugene, when the Hawks sat at 1-3. Futility on the road at the plate has been the biggest issue, as the team has stumbled to a .226 batting average in the 18 road games, with only Rafael Lopez (.348) among the regulars hitting above the .300 mark away from the Treasure Valley. Boise is hitting just .244 with runners in scoring position on the road and is a woeful 3-for-22 with the bases loaded. Tonight’s game, with Su-Min Jung and Cam Greathouse piggy-backing, is a must-win situation, with the team sitting two games back of both Spokane and Tri-City in the East. A loss all by eliminates the Hawks from a first half pennant chase, but a win pulls Boise within a game of Spokane (and possibly Tri-City, depending on their game tonight) with Yakima heading to town on Thursday night. 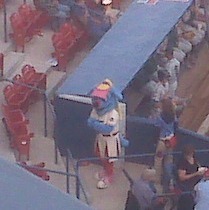 A NEW MASCOT: The Indians have debuted a second mascot – joining what was the world’s only Spokaneasaurus, Otto. 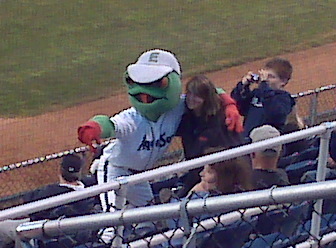 It is a female version, named Doris – that splits time with Otto during the on-field promotions…joining Everett with multiple mascots (not counting Recycleman, who makes appearances here and there in Spokane). TOUGH DAY IN THE BIGS: Yesterday was a tough day for former Hawks at the major league level, as both Jerry Blevins (Oakland) and Mitch Atkins (Baltimore) were sent to the minors. Blevins was DFA’d, meaning he must clear waivers before having the option to rejoin AAA Sacramento, while Atkins was optioned to AAA Norfolk. Robinson Chirinos had a memorable debut with Tampa Bay, smacking a double in his first MLB at bat. 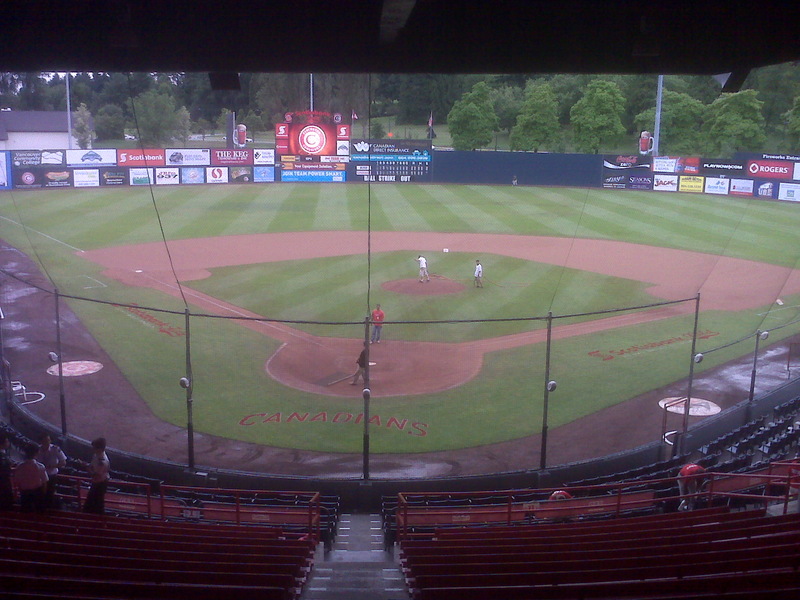 The Hawks closed out the Canadian portion of the current eight-game road trip with a pair of weird ball games – a rain-shortened 6-2 loss to Vancouver, followed by the fastest game in the Northwest League this season, a 1-0 loss in just 118 minutes. The rain-game was interesting from the standpoint that the field at Nat Bailey Stadium was in much poorer shape than what we saw last year in the infamous “Forfeit Game” in Everett – standing water on the warning track all around the field, though the outfield was not as much of a lake as it was a year ago. It was the first time I’d been in a weather-shortened game since a game in Vancouver in 2003. The next afternoon the Hawks got a great start from Willengton Cruz, going a season-best 5 2/3 innings, striking out eight, but big Steve McQuail launched a second inning homer to provide the only offense in the game. 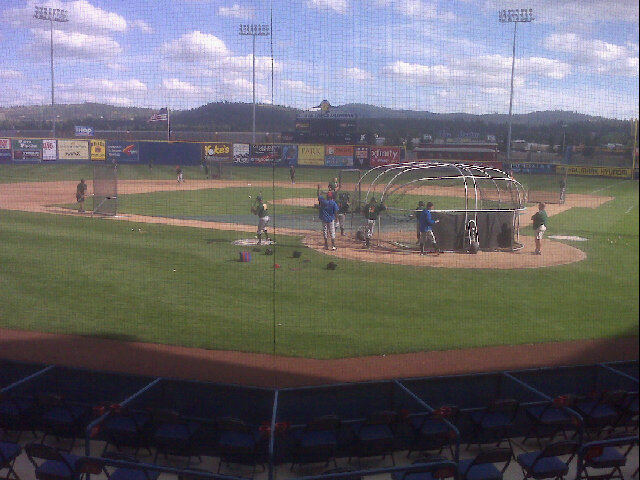 Boise hit balls hard all afternoon – right at C’s players. As Mark Johnson said on the pregame show, at least we got one win against the AA team (Vancouver) – since the C’s have a much, much older team than Boise. FINAL LOOKS IN CANADA: The kids park at Nat Bailey has been improved once again in 2011 – adding not one, but four bouncy areas for the children in Vancouver. 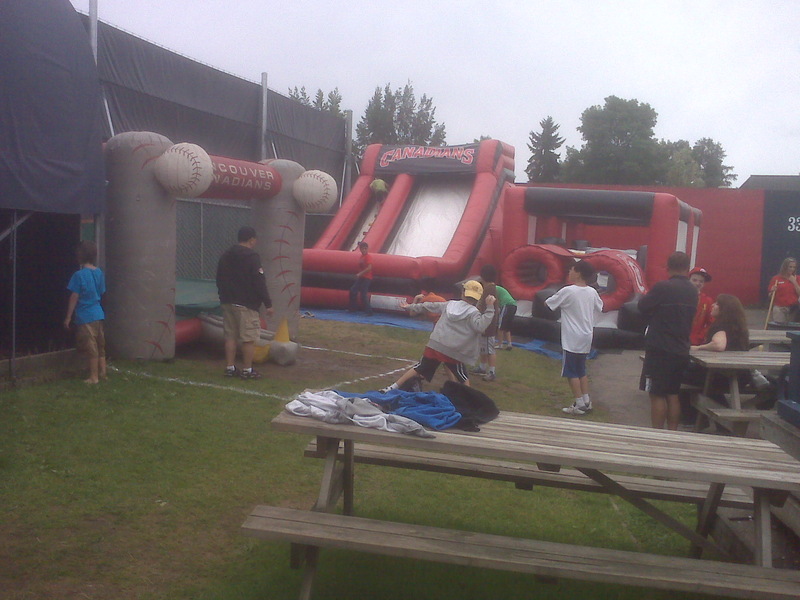 An obstacle course, a true bounce house, an inflatable slide, a speed pitch, and a hitting cage all for the kids, while the best barbeque pit and beer garden awaits adults on the first-base side. 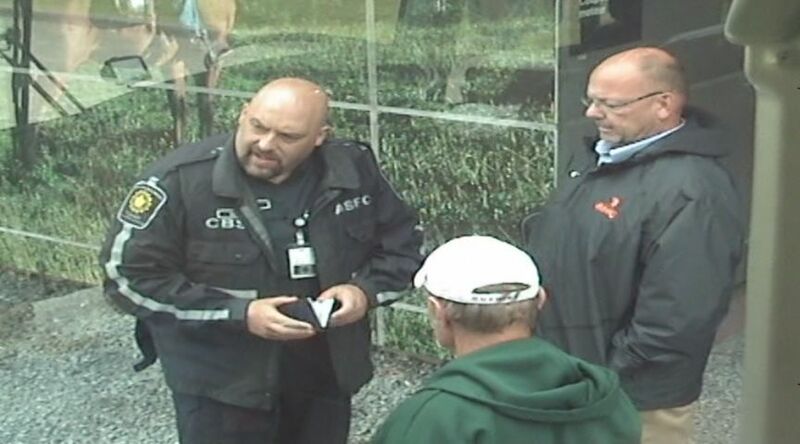 RECORD TIME AGAIN: Bob Grimes must have a way with all customs agents – as it was a breeze coming back across the US-Canadian border. The Hawks trainer hopped off the bus and talked with the guard – the bus pulled, we departed, went through customs, and were away in just 17 minutes…last year, I think we spent 17 minutes waiting for an agent to tell us what to do. THE SCENIC ROUTE: Instead of taking the typical drive down to Seattle, over Snoqualmie Pass, and over to Spokane – the team decided to take a more scenic drive, traversing the state on US-2 – across Stevens Pass, seeing raging rapids on the Wenatchee River and some of the most beautiful country in central Washington. The team arrived in Spokane at just after midnight. 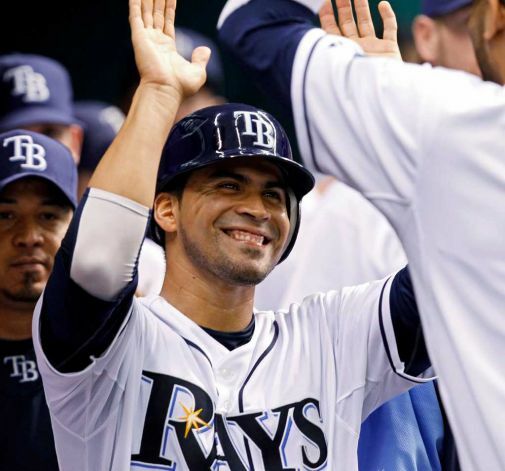 WELCOME TO THE SHOW ROBBY: Following a 16-inning marathon against the Boston Red Sox on Sunday night baseball, the Tampa Bay Rays called up former Boise Hawk Robinson Chirinos to replace Jose Lobaton, who was injured in the game. Robby, who played for the Hawks in the 2002 NWL championship season, became the 87th former Boise player to play in the Major Leagues. He becomes the 13th player off that team alone to play in MLB joining Rich Hill, Ricky Nolasco, Clay Rapada, Andy Sisco, JK Ryu, Ryan O’Malley, Geovany Soto, Felix Pie, Randy Wells, Micah Hoffpauir, and Ronny Cedeno. 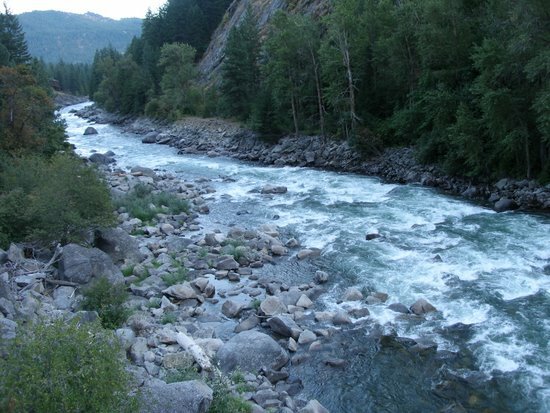 MORE FROM SPOKANE: We’ll take a look at the trip in Spokane tomorrow – hoping for at least one day with warm temperatures, instead of the rain that hampered the team in Vancouver. A slump is exactly what the squad is in right now – having lost five of their last six games, including three in a row, with offensive woes plaguing the team. The Hawks have not recorded an extra-base hit since Paul Hoilman clubbed a two-run homer on Sunday in the first inning, a span of 34 1/3 innings. 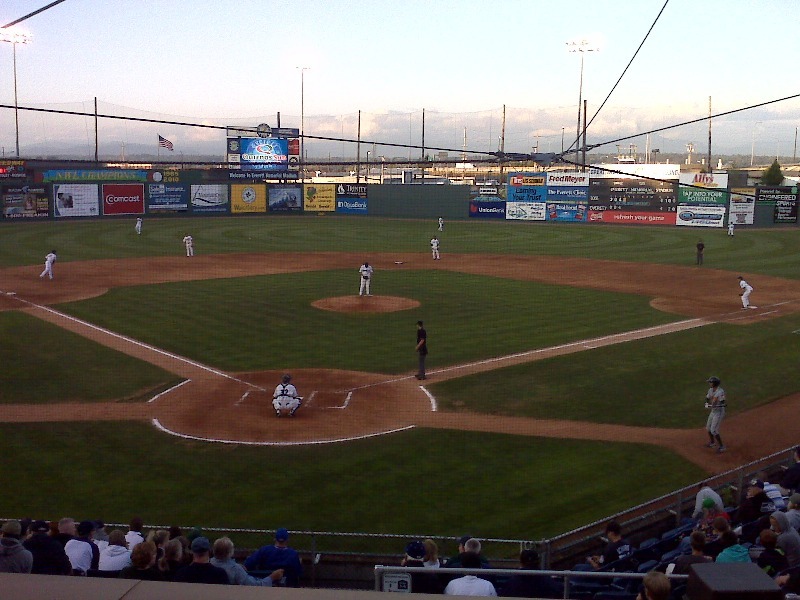 Boise now ranks dead last in the Northwest League in home runs, doubles, triples, extra base hits, and slugging percentage – although the pitching staff has done an admirable job keeping the team in games with a 4.10 ERA. Kudos to Yao-Lin Wang last night – despite giving up three LONG home runs to Vancouver hitters, the youngster from Chinese Taipei (Taiwan) attacked hitters all night, finishing with a career-high nine strikeouts. The total equaled the most by a Boise pitcher since Jeff Antigua fanned 11 Eugene Emeralds in 2009 (Austin Kirk and Cam Greathouse each struck nine men in 2010). The Hawks are short-handed in Vancouver, as a pair of players did not make the trip North. Reserve infielder Travis Garcia did not have a passport to get across the imaginary line between the countries, while catcher Yaniel Cabezas (who had been the Hawks hottest hitter of late) is a defector from Cuba and cannot cross international lines. Both players are in Mesa to stay fresh and will rejoin the team in Spokane on Monday. That, coupled with injuries to Hector Mayora (rotator cuff stiffness) and Joe Zeller (shoulder strain) – the Hawks have just 24 healthy bodies and just one reserve available as a position player. 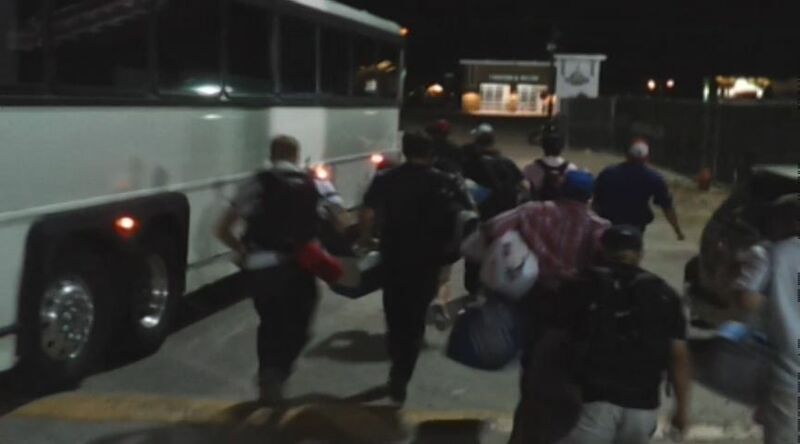 ACROSS THE BOARDER: Year in and year out, crossing the U.S.-Canadian border has been a struggle for the Hawks, whether it be a long line of buses, players with records that folks don’t know about, or players who do not have their documentation in order. This year, trainer Bob Grimes had a system in place – using a CD case that had every member of the travel party’s passport and documentation in it. He and Hal (our trusty bus driver) got off the bus and in less than 30 minutes, we were singing “Oh Canada”. It was an all-timer. THE FUNGO: Most people know of a fungo as the long-skinny bat that coaches use to hit ground balls during batting practice, but the Canadians front office has taken it to new levels. The C’s have unveiled the biggest hot dog I’ve ever seen – a two-foot long dog called, yes, the Fungo, on a bun that resembles a loft of french bread. 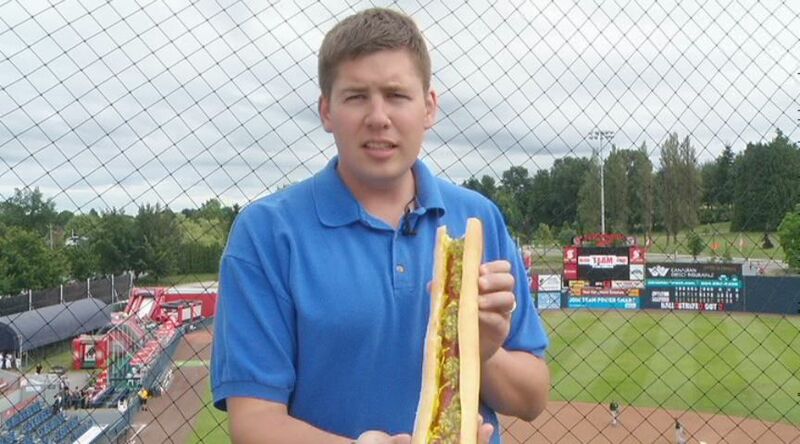 It is a heart-attack waiting to happen, though KBOI-2’s Troy Oppie pounded one down in less than 10 minutes. IS OUR MONEY WORTHLESS: You used to come to Canada and it was fun – one would get $1.40 or more for the U.S. Dollar and businesses wanted greenbacks…not anymore. You must have Canadian money at any food establishment, as the dollar is worth just 93 cents in Canada – and if you go to a bank to exchange, they’ll even tack on a $3.00 surcharge (in Canadian) to the transaction. Gonna be eating at the park the rest of the way. CUBS NEWS: The Cubs have finally signed a Top-15 draft pick, as Zeke DeVoss, a speedy outfielder from Miami, the third-rounder from 2011, has signed and debuted in Mesa (albeit as a second-baseman)…also, promotions have happened in the minors – as Matt Szczur has headed to Daytona, Jae-Hoon Ha to Tennessee, and both Ryan Flaherty and Brett Jackson to Iowa…also kudos to Russ Canzler, who was named MVP of the AAA All-Star Game after mashing a three-run homer to help the International League to victory. 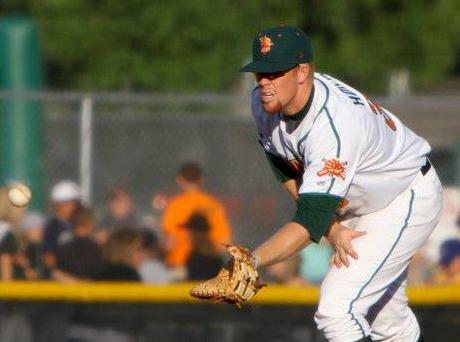 A total of 148 former Boise Hawks players are currently active in professional baseball – from the independent leagues to the Major Leagues. 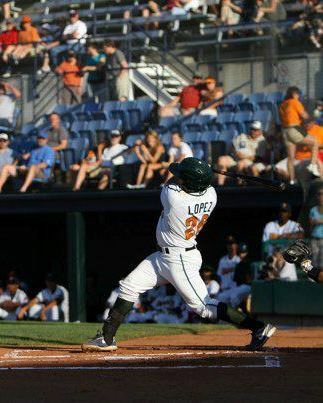 Click on the following link to see how your favorite former Hawks are doing: Boise Hawks Alumni Report 7-14-11. Three games into a series with the Everett Aquasox, it has been a rollercoaster ride for the Boise Hawks – using the long ball to win the series opener, then blowing a pair of leads late in Friday and Saturday night losses. 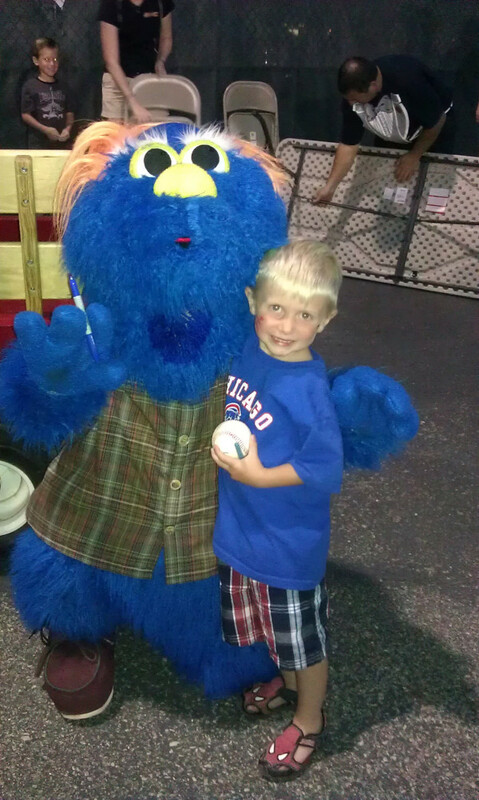 One of my highlights of the weekend was the performance on the field by the Sweet Right Brothers traveling mascot troupe, which entertained the crowd on Saturday night. Outstanding act by a trio of guys from North Carolina that made the long trek across the country in a pick-up – thanks for keeping Hawks’ fans entertained. Also, kudos to the fireworks proprietors, who had another outstanding display on Friday night – including the artillery type fireworks that wowed the crowd. Thursday was about the homers – as Paul Hoilman launched a tape measure shot into the trees deep in right-center, with Jose Guevara curling one just around the foul pole in left. Friday, it was an up-and-down night from Cam Greathouse, who struck out seven men in two-plus innings, but he walked Patrick Brady twice, with Jim Wood delivering a pair of run-scoring hits that gave Everett a win. Saturday was just a weird game, as the Hawks trailed 5-0, took a 6-5 lead, then lost, 8-5. A LONG DAY: It was an extremely long Saturday for me – as a long game on Friday night (getting to bed at my typical 1 a.m.), but a 6 a.m. walk-up call ensued, as my family and I competed in the Fit For Life racing series, co-sponsored by the Boise Hawks. 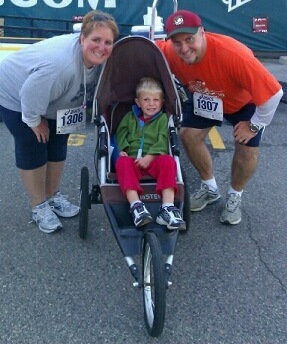 The race had a 5K, a 10K, and a half marathon, with the Safford deciding to tackle the 10K – which after 93 minutes, we were crossing home plate at the ballpark. Special thanks to race organizer and Hawks fan Jeff Ulmer for making it happen. 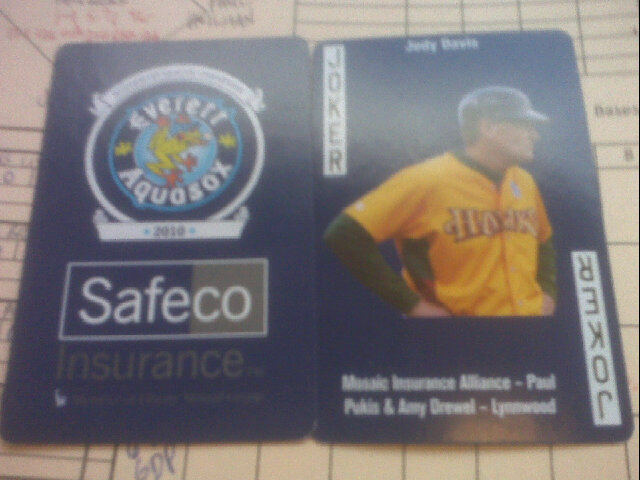 THE JOKER: Visual evidence of the Everett Aquasox 2010 playing card set that features former Hawks manager Jody Davis as the “Joker” in the card set. 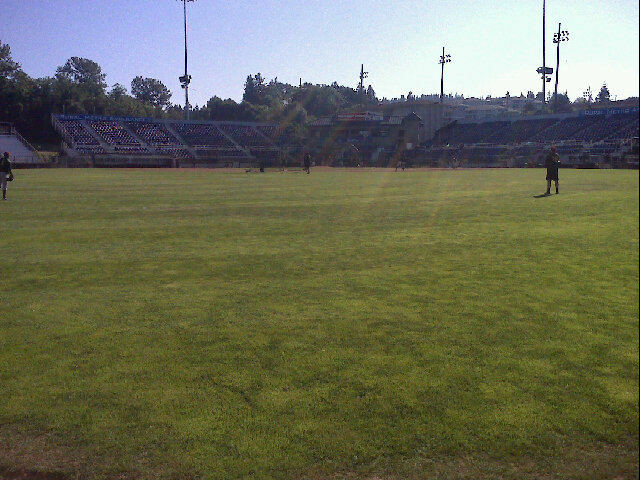 The card was in reference to Davis pulling the Hawks off the field in August of last season, resulting in a forfeit on a night in which the Aquasox had a sold-out crowd. ROSTER MOVES GALORE: A carousel of roster moves have changed up the Cubs farm system over the last week – with the Hawks amongst the teams in the mix. Ben Klafczynski was promoted last night to Class-A Peoria, while Su-Min Jung, who pitched for the Hawks in 2009, returns to Boise, with Blair Springfield, a 2009 draft pick, heading out of Mesa for the first time to join the Hawks. Peoria sent former Boise outfielder Matt Szczur (who will play in Sunday’s MLB Futures Game in Phoenix) to High-A Daytona, while pitchers Brent Ebinger and Matt Loosen are headed to AA Tennessee. Marcus Hatley was promoted from Daytona to Tennessee, while Chris Rusin and Marwin Gonzalez were promoted from Tennessee to AAA Iowa. COVERAGE FROM VANCOUVER: Look for extended coverage in the Treasure Valley of the Boise Hawks trip to Vancouver next week on KBOI-TV, Boise’s CBS affiliate. Sports anchor Troy Oppie will be accompanying the team on the trip North – including skyping live on Tuesday’s morning show from the bus, while learning how the minor league players are able to eat on just $20 a day in meal money. 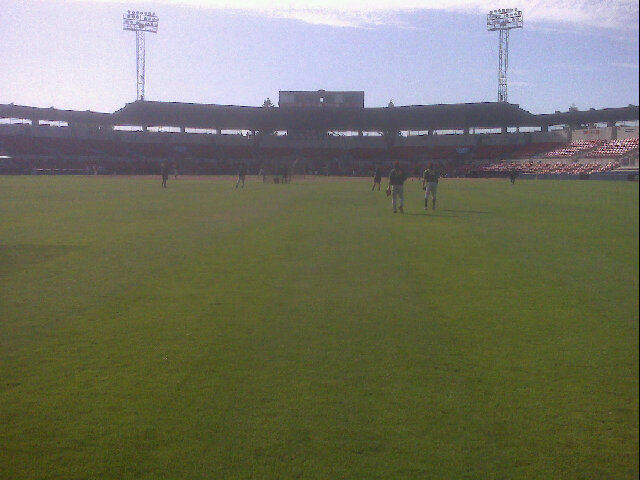 The Hawks returned home from Yakima with a 9-8 record, having dropped their final two games of the trip – and faced a group of Cubs field coordinators waiting for them at Memorial Stadium. However, the mystique that is the “Big House on Glenwood” for nearly 25 years continued each of the last three nights – as Boise picked up three extra-inning walkoff wins, by three different players. Before a super-sellout crowd on the 4th of July, the squad rallied from a 4-1 hole to tie the game late, with Paul Hoilman ending a 1-for-20 slump with a walk-off homer – the first by the Hawks since Jake Opitz won a game on opening night in 2008. Tuesday, the bullpen squandered a 4-0 lead, only for Kenny Socorro to hit a seeing-eye single to right in the 10th for another win. And tonight – it was a Ben Klafczynski bloop single to left that scored Pin-Chieh Chen with the winner in the 12th inning. It marked the first time in recent memory that the Hawks played three-straight extra-inning contests (they played back-to-back games in extras in both 2003 and 2004). The piggybacks the last two nights have been stellar – as Welington Cruz and Joe Zeller combined to allow just one run in eight innings, while Luis Liria (who went a season high six innings) and Kyler Burke limited Yakima to just two runs and five hits in 10 innings. HOW BOUT THEM EMS? 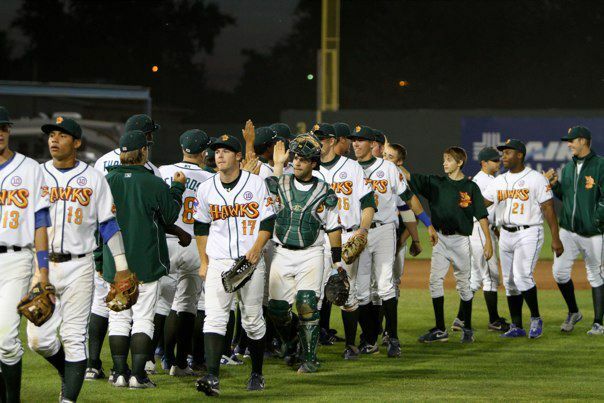 The Hawks opened up 2011 in Eugene, losing 3-of-5 to the Emeralds – though had the chance to win 4-of-5. 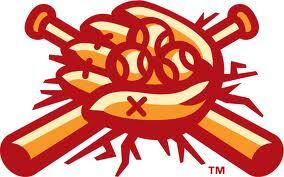 Until tonight, Boise was the lone team to beat the Ems, as Eugene set a new NWL record by winning 14-straight game. THE LONG DRIVE HOME: Following Sunday’s game in Yakima, the Safford family loaded up the car and made the trek back to the Treasure Valley – and it was an interesting five hours. Not only did I have to stop twice to get coffee, we witnessed a crazy event in Hermiston, Ore., where a trunk ran off with $173 in unpaid gas – it was intense. I hope they caught the guy. ROSTER MOVES: The Hawks added a player today, as Colin Richardson joined the team from Mesa – as righty Hector Mayora is on the shelf for at least a week with shoulder soreness. Richardson was thrown into the fire tonight, tossing two shutout innings for the win. Other news has both Marwin Gonzalez and Chris Rusin earning promotions to AAA Iowa, while Marcus Hatley is now at AA Tennessee. Finally, congrats to former Hawk, Austin Kirk, who tossed a nine-inning no-hitter at Class-A Peoria.